The Hardin County Community Endowment Foundation held its annual awards on Thursday at the New Providence Roundhouse and many organizations left happy after receiving grand funds for various projects around the county. While the organization did give $87,535 to local organizations on Thursday, it also gave its Making a World of Difference award. This year that honor went Jim Hoffman of Iowa Falls for his work at the Scenic City Empress Boat Club. Hoffman said he’s proud of the award but said everyone in attendance was responsible for making the communities in Hardin County better. “I’m pleased to be a part of it,” he said. 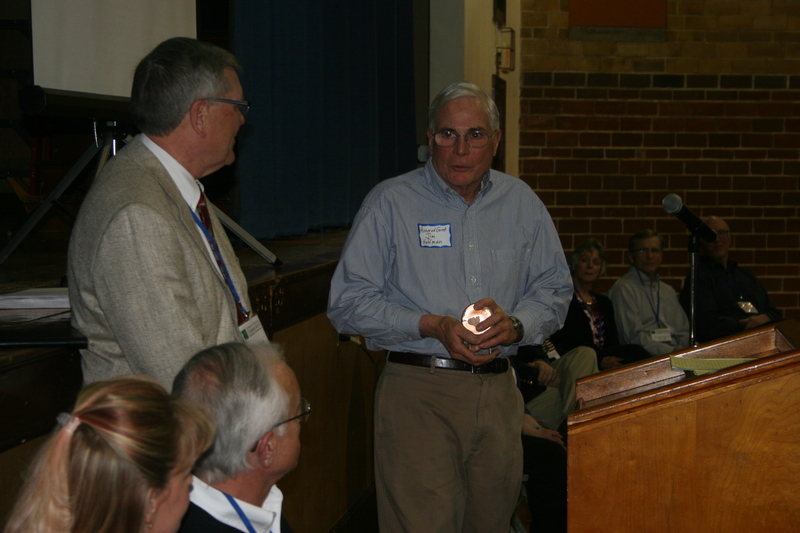 Rob Wohlert, co-chair of the HCCEF board presented the award to Hoffman, saying he is the type of leader who says yes to volunteering his time, providing guidance and contributing financially. “Jim doesn’t say yes because he wants recognition, he says yes because it’s the right thing to do,” Wohlert said. Awards of the night went to the Ellsworth College Foundation for the Pat Clark Art Collection Oak Street mural project, which will be on the building next to the AMR ambulance building that currently has a southwest scene on it. The new mural will be an adaptation of Virginia Daley’s “Rock Cliffs of Iowa Falls. HCCEF granted $7,500 towards that project in the Arts and Culture category. Others receiving awards in the Arts and Culture section included the ENP Foundation/Hardin Count Performance Series for $2,500 to bring Masters of Soul to the county in April 2017 and St. Matthew’s By-The-Bridge Episcopal Curch for $885 to host a summer organ recital series. For Community Betterment, the top award recipient was Hubbard Golf and Recreation with an $8,000 award, but all groups in community betterment saw a big boost from the HCCEF. There were three awards of $7,500, including to Ackley Public Library, Renewal Community Inc, for work to the New Providence roundhouse and The Ladies Social Gathering to replace retaining walls at Union Cemetery. Iowa Falls Housing got $7,000 for the Timberview Community Room revitalization project, Steamboat Rock Visionary Group will receive $5,000 for improvements to Washington Square Park and the Greenbelt Humane Society gets $2,500 for cat room improvements. South Hardin FFA/Welding program was awarded $7,500 for a welding simulation lab project in the education category with Big Green out of Hubbard and the Hubbard Public Library getting $2,000 each. In the youth development category, the IF-A Little League Boosters were awarded $8,000 to go towards a bleacher project for Burton Family Fields. The ENP Parent Teacher Organization was awarded $3,000 for the ENP lower playground renovation and Ackley Youth Center will receive $2,650 for a multimedia project. Also sports-related is $4,000 for Greater Eldora Youth Program for a ball diamond concession stand project. Providence Township Volunteer Fire Department was awarded $2,500 for bunker gear replacement as well.